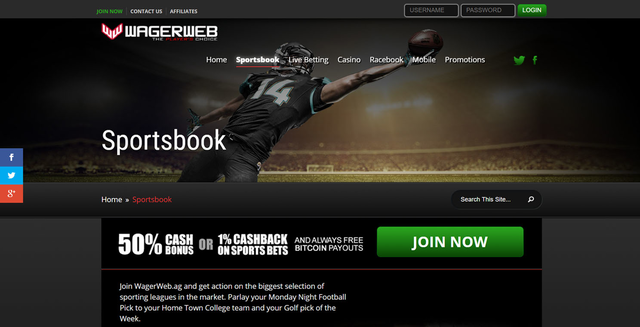 WagerWeb: A Sportsbook Worth Checking Out? 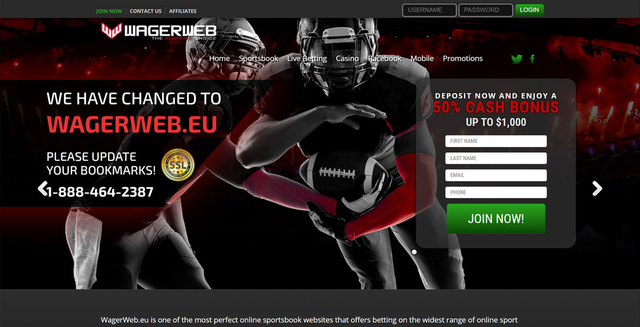 WagerWeb Casino is one of the longest-running Bitcoin sports betting sites in the online gambling industry. Launched in 1994, the gaming hub offers a sportsbook, a racebook, and a casino. The gaming portal keeps up with the latest technology and allows you to access the site through mobile devices. In addition, WagerWeb supports crypto coins for faster and safer transactions. You will find several bonuses on WagerWeb that will keep you betting on more sports events. Even better, the gaming hub has an affiliate program that you can join. To be more attractive to new players, WagerWeb Casino lets sports bettors buy and sell up to five points. But is having unique features, various sports betting events, and several bonuses enough to convince you to sign up? Continue reading this sportsbook review to find out if WagerWeb is deserving of your bets. WagerWeb Casino offers you bonuses whether you are betting on sports or playing in the casino. You will also find exclusive deals for sports betting and for casino wagering. Learn more about these offers below. New players and those who have been inactive for more than three months can claim this bonus. You can choose to get either 50% cash bonus or 75% free play bonus. To claim this reward, you need to deposit at least US$100, and your largest bet should be 20% of your deposit amount. Should you decide to withdraw this bonus, you need to complete the 15x rollover requirement. You can get 1% cashback every Monday when you join the Elite Bonus program. This means that whether you win or lose, you can receive cashback. But it is important to note that the reward is credited as free play. You also need to make a new deposit to be eligible for this bonus. You can get a maximum of US$10,000 payout every week with this reward. Simply deposit using bitcoins and you can request a payout all throughout the week. Take note that the highest payout amount that you can have per day is US$3,000, except on Saturdays and Sundays. Deposit nine times and your 10th deposit will be free. The maximum amount that you will receive is US$750. To qualify for this reward, you need to make nine deposits without cashing out. Deposits should be within 90 days only. In addition, you must complete the 5x rollover requirement. The online bookie makes sure that you have enough rewards to continue betting on your preferred sports events. WagerWeb’s bonuses do not stop there as the betting site offers an elite bonus, a high roller bonus, and casino cashback. The betting site boasts its sportsbook that allows you to bet on your favorite sports games, such as basketball, tennis, and soccer. Sports events like NBA, MLB, and NFL are also available. If those are not enough, you can go to the esports section where you can find popular esports games like LOL and GS:CO.
Before you choose your game, the gaming hub will require you to choose from among the standard bet types available: if-bets, teasers, and round robins. Once you are done, you can select your preferred sports event. Other than the sportsbook, WagerWeb offers live betting for you to wager on live sports. If you get tired of betting on sports, feel free to navigate the racebook and casino sections of WagerWeb. The gaming portal accepts fiat and crypto coins. This means you can pay using USD or BTC. In addition, the betting site supports several payment methods that you can choose from. All deposits through credit card are free. Should you decide to deposit through P2P money transfer, take note that you cannot fund your account on Sundays. In addition, you can send funds only through bank wire if you are in the US, Canada, and the UK. If you choose credit card as your withdrawal option, you need to provide a credit card authorization form. In the event that the betting site finds your account suspicious, the gaming hub will require you to give documents like valid ID and utility bills before processing your withdrawal request. WagerWeb Casino: Is It Worth It? WagerWeb has been providing sportsbook enthusiasts, racebook bettors, and casino players with a wide selection of sports events and games to bet on since 1994. There are various virtual and live sports games including basketball and soccer. There is even eSports Bitcoin betting. While waiting for the results of your favorite sports or esports events, you can check the racebook and casino sections of WagerWeb and bet on certain games according to your liking. You can make the most of your betting experience by claiming the bonuses available. You can get cashbacks, cash bonuses, and even a free deposit. More than those, the gaming portal promises fast transactions as it supports Bitcoin. Overall, you will not be disappointed with WagerWeb Casino. The betting site hosts a great selection of games as well as rewarding bonuses. 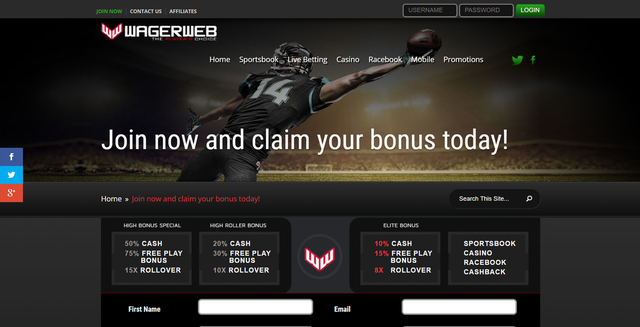 With all its great features, WagerWeb is one of the betting sites that you should be a member of.